Edited by mab01uk, 11 February 2019 - 08:19 PM. A true legend. This man has helped many of us over the years. The written texts were always good, the photos less so! Bless him. He started an institution ! I live local to Sparkford where I often take my son, and was fortunate to meet him several times as he always seemed to sit in the cafe for lunch with the rest of us in his 'reserved seat'! True gent and legend lost. I thought he deserved more than an OBE. Before the rise of the Internet, the Haynes manual was the only resource most people had. Must have helped millions save billions of £ over the years. The photos in the older Haynes manuals seemed mucher clearer to me, in later years the quality of paper used and photo reproduction seemed to get downgraded or cost reduced with a loss of definition and unfortunately the classic Mini manuals lost whole previously useful chapters which were now considered to be beyond the average DIY mechanic! Around 35 years ago back in my A-Level days, one of the questions on the A-Level General Studies exam paper was to write an essay about a book you'd recently read ... I chose the Haynes Mini workshop manuals, maybe a little wide of the intended result but someone must have appreciated my efforts because I achieved a pass grade! John Haynes was a true legend. 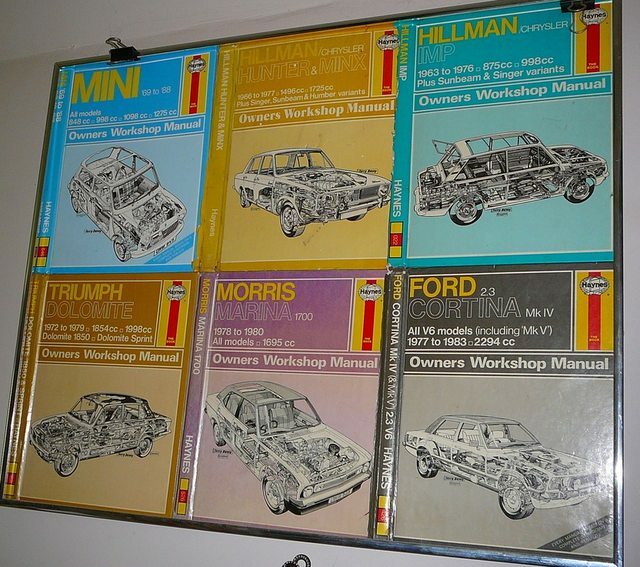 I have a virtual library of oil and grease stained Haynes Manuals in my garage, lots for cars I dont own anymore, some for cars Ive never owned, just bought them for a few pence at auto jumbles. I truly have saved many many thousands of pounds over the years being able to DIY with the assistance of these great books. I hope the legacy keeps going but perhaps modern cars are less likely to be worked at by owners and the demographic of owners having the skills and ability to do so are shrinking. I always found that the manuals missed parts out, for example "undo the 4 bolts into the rear heelboard and remove the subframe assembly" should have been "snap off the four bolts into the rear heelboard, skin your knuckles, cuss and swear and then kick the cat". Seriously though I was brought up with a Haynes manual from the time I was a child and they were always a godsend doing anything. In fact I just used one to rebuild my MK2 jag and its amazingly well detailed and helpful. Back in the 60's, 70's and 80's when people used to work on their own cars a lot how much money did people save using these manuals over paying for repairs, how many people managed to get to work to earn a crust and how many people saved the money to pay other bills or provide things for their families? I bet its millions. 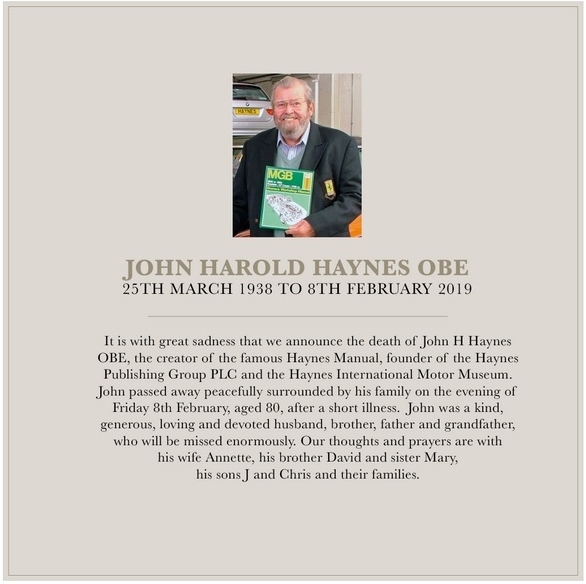 Rest in piece Mr Haynes, you are a legend.